The Capitol Gorge trail is located in Capitol Reef National Park. The trail leads through a narrow canyon gorge that was once used as a road by early pioneers. An area of canyon walls with numerous names of the early settlers is designated as the Pioneer Register. Even earlier inhabitants also left their marks in the form of petroglyphs and some painted hands pictographs. The 2 mile long dirt road that leads from the Capitol Reef Scenic Drive to the trailhead is a treat in itself as it winds its way through the narrow gorge with its sheer canyon walls. The road is maintained to make it passable by passenger cars but it may be closed due to the possibility of flash floods when threatening thunderstorms are in the area. The Golden Throne trail also begins from this trailhead. The trail into the canyon begins by passing through the covered picnic area. Stay on the left side of the canyon when the trail starts out so you don't miss the rock art. The trail will drop down into the wash a little further on. The first rock art is of a couple of painted hands pictographs. There are many faded Fremont style petroglyphs. The big one in this picture is possibly an etched representation of a deified ancestral spirit or what would presently be called a Kachina. At first the canyon walls tower to great heights above the trail and gradually become lower as the hike progresses. The high walls provide a little bit of relief from the hot sun in the summer months but during the winter months when the sun is lower in the sky they tend to put the canyon in a state of perpetual shade. The easy hiking makes Capitol Gorge one of the most popular hikes in the park for people with small children. The narrow passageway and lack of drop offs provides a relaxing place for parents while their toddlers explore this interesting new world that stretches out before them. The Pioneer Register displays names of settlers from the late 19th to early 20th centuries. Most names that have been carved in the park more recently have been sandblasted away and any new contributions will cost you $250. Metal pipes can be seen protruding from the canyon walls that were once used as telephone poles. Early telephone lines were sometimes made from any cheap wire they could get their hands on including bailing wire. The Tanks is an area in a side canyon where large potholes in the sandstone serve as natural cisterns. To see them requires hiking a primitive trail up the side of the canyon a short distance. The first bit of the side trail is a little steep but it levels out a good deal when it reaches the bench area above the wash.
From the bench there are some really nice views of the cliffs above the gorge. There are many potholes of various sizes both up and down the side canyon in both directions from the trail. Some of them hold a considerable amount of water and even have small creatures like shrimp and tadpoles. The water can tend to get brackish as it stagnates between storms. The water should be left for the use of the native plants and animals and not used as a water source for hikers. The Capitol Gorge trail can be enjoyed by most all of the visitors that come to Capitol Reef. 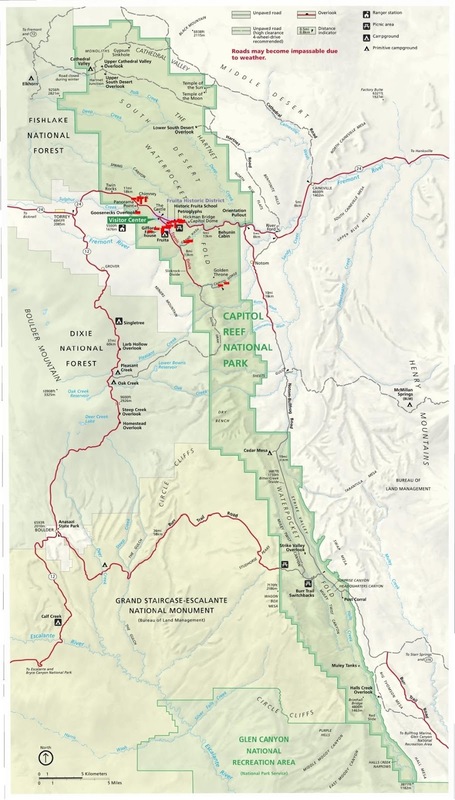 The short distance to the petroglyphs can make for a hike of less than a half mile and going beyond the turnoff to the tanks you can hike all the way to the Notom Road for a much longer outing. Several of the side canyons can also be explored for short distances. If you would like to see it for yourself then all you have to do is 'Take a hike'.